Learn how to THRIVE—not just survive. Sign up today! YMCA summer day camp offers children in grades K-8 action-packed and adventure-filled experiences, where young people can make lasting friendships while having a blast! 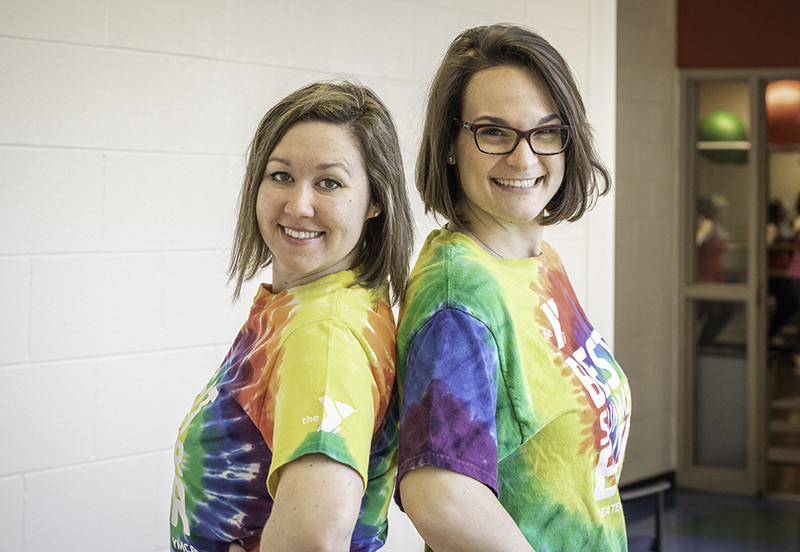 Among the many summer camp participants at the C. W. Avery Family YMCA this summer, you’ll find Youth and Family Director Shannon Stawikowski and Youth and Family Manager Trisha Dust, the two creative minds behind the Plainfield’s Y’s popular summer day camp program. Stawikowski started her career at the Greater Joliet Area YMCA in 2013 when she applied to work with children in the Y’s Kids Corner and Pint-Sized Pupils program. She was searching for an exciting, friendly place to work and the Y seemed like the perfect fit. Not too long after Stawikowski started her career at the Y, Dust began her Y journey, just two months after becoming a YMCA member. Dust was a new Plainfield resident looking for a place to meet people in the area when she found the Y. She quickly felt a sense of community at the Y and wanted to join the Greater Joliet Area YMCA staff team. It didn’t take long before Dust settled into a part-time position at the Y as a Kids Corner attendant. Since beginning their careers at the Greater Joliet Area YMCA, Stawikowski and Dust have spent their time working in a variety of youth and family programs. Today, you’ll find Stawikowski and Dust at the helm of summer day camp and spearheading new opportunities for children and families at the C.W. Avery Family YMCA. Stawikowski: I grew up in Frankfort, IL and I spent every summer in New York with my family at our summer home. While in New York, I attended summer camp every year and I loved it. I graduated from Lincoln-Way High School and I continued my education at Moraine Valley Community College for one year before I transferred to Western Illinois University. I graduated from Western Illinois University in 2004 with a bachelor’s degree in psychology and a minor in sociology. After graduation, I went to live in New York for a short time, where I worked as a camp director for the same summer camp I attended as a child. Dust: I also grew up in Frankfort, IL. I graduated from Lincoln-Way East High School in 2004 and attended college at the University of St. Francis in Joliet. I graduated in 2011 with a teaching degree in special and elementary education. My husband and I have two children, Maddie who is 13-years-old and Michael who is 6-years-old. Q: What is your favorite thing to do when you’re not busy with summer camp? Stawikowski: I love to travel. One of my favorite places to travel to is the Dominican Republic, but I also enjoy skiing. Dust: I enjoy spending time with my family. It’s not uncommon for us to have sleepovers in our loft at home with pizza, movies, and games. In the summer, I enjoy attending festivals with my family and going to car shows every Tuesday. We also spend every 4th of July at our family’s lake house in Antioch, IL. Stawikowski: My husband inspires me. He always goes above and beyond and seeing that inspires me to do better. Dust: My family! I come to work every day and do what I do for my family. Q: What is your favorite part about working with youth and families at the Y? Stawikowski: I love to see all the fun programs we organize come to life. I enjoy watching our Y families have a great time and seeing how our programs affect our community in such a positive way. Dust: Working with Shannon and all of the employees at the Y. We make the best team and we are able to come up with fun, creative ideas to serve our community. Q: What can families expect during summer day camp this year? Stawikowski and Dust: Oh, there’s so much! We have some pretty cool field trips planned and STEAM activities for our older camp participants. 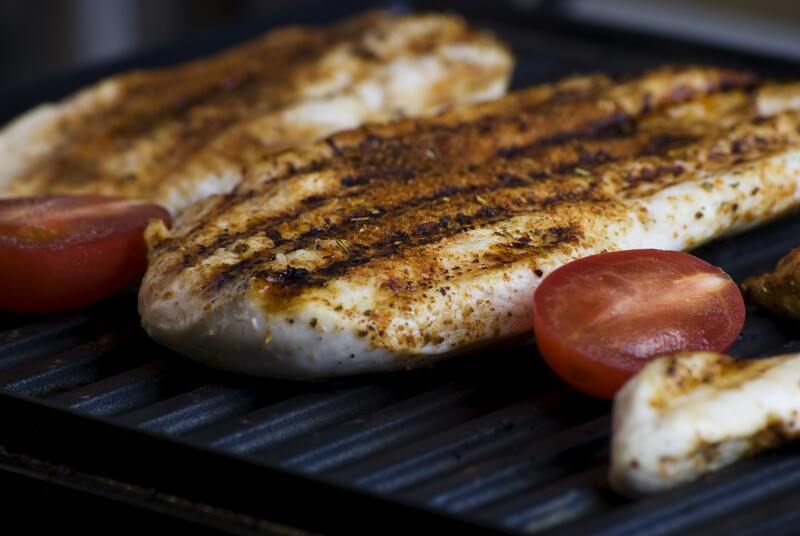 We are also looking forward to teaching our campers more about healthy eating habits. Campers will participate in gardening lessons, learn healthy recipes and try new foods. “We definitely want to educate our campers and their families on the ‘farm to table’ experience,” said Stawikowski. Q: What’s your favorite summertime song? Dust: “Firework” by Katy Perry. Registration for the YMCA’s summer day camp is underway. If you have questions about youth and family programs, summer day camp or just simply want to say ‘hi’ to this creative duo, make sure to stop by the Youth and Family office the next time you are at the C.W. Avery Family YMCA. You can also email them directly at [email protected] and [email protected]. 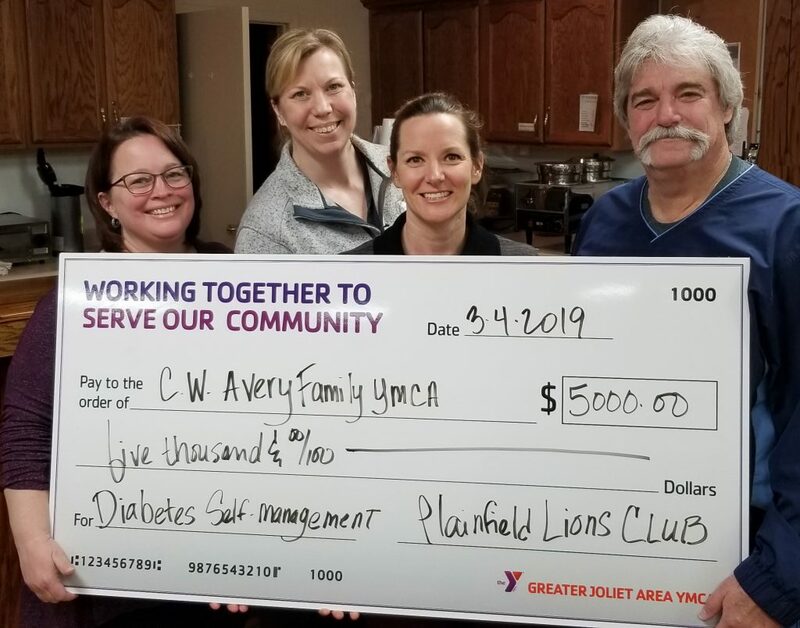 The Lions Club of Plainfield has donated $5,000 to the C.W. Avery Family YMCA in support of its Diabetes Self-Management Program, Take Charge of Your Diabetes. This is the second consecutive year the Lions Club has supported this important healthy living initiative. 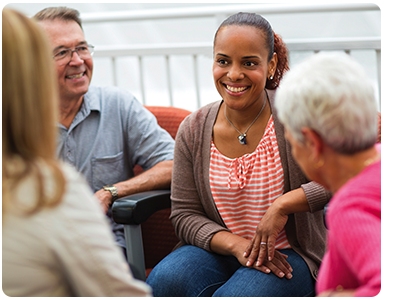 Designed for diabetics, pre-diabetics and caregivers, this seven-week program is free and open to the community. 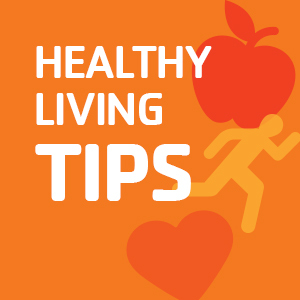 Using curriculum developed at Stanford University and through a dynamic partnership with Age Options, suburban Cook County’s leading agency on aging, this class will focus on healthy eating, exercise and blood sugar monitoring, among many other self-management tools. A new session of the Y’s Diabetes Self-Management Program will get underway later this spring. Classes will be held on Wednesdays from 12:30-3 p.m. and 5:30-8 p.m. at the C.W. Avery Family YMCA, 15120 Wallin Drive. Classes will run from April 10 to May 22. The first day of class will include a brief introduction to the curriculum and allow participants to complete paperwork. Registration is required. Pictured above (L-R): YMCA Staff Members Eileen Scotchlas, Erin Lightbody and Lisa Behounek; and Roger Bonuchi. As one of the nation’s leading nonprofit charities, the YMCA is committed to strengthening local communities through youth development, healthy living and social responsibility. Through its financial assistance and scholarship program, the Greater Joliet Area YMCA works to fulfill its mission of ensuring that its programs are available to everyone and no one is turned away due to the inability to pay. 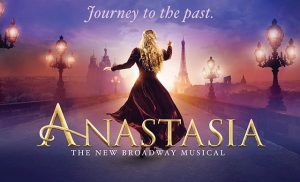 The Fab 50 invites you to attend Broadway in Chicago’s musical adaptation of “Anastasia” at the Nederlander Theatre in Downtown Chicago. Time: 11:30 a.m.- 7 p.m.
Open to ages 50 and up. Cost includes play admission and transportation. After the 2 p.m. show, participants will have the opportunity to enjoy a meal and shop at some of the city’s nearby establishments. This incredible story will transport you from the twilight of the Russian Empire to the euphoria of Paris in the 1920’s, as a brave young woman sets out to discover the mystery of the past.